Louisville Slugger sets itself a part from other bat makers with over 130 years of bat making experience, outstanding turning models, and the ability to offer the best quality wood on the market. From the earliest days of the game, Louisville Slugger has always employed the most powerful technology available in the bat business. Louisville Slugger has been turning bats since 1884 and is the Official Bat of Major League Baseball. Now you can personalize a bat with the historic Louisville Slugger logo that was used by pros like Babe Ruth, Ted Williams and many more. Looking for the perfect classic gift for a dad, grandpa or new baby? A full size 34" personalized Louisville Slugger bat is the perfect gift idea. Note, these bats are not intended for play. Back in the days of Ty Cobb and Babe Ruth, that meant having the most skilled craftsmen at the lathe, handcrafting bats to the most demanding specifications of the world’s most demanding players. Major Leaguers have turned to Louisville Slugger. In addition to the classic Louisville Slugger bats, if you are a fan of a major league baseball team you can now order your team's favorite MLB logo and color scheme on a custom personalized Louisville Slugger bat which is the the official bat of major league baseball. These customizable MLB bats make great gifts for weddings, birthdays, anniversaries, team awards or celebrations of any kind for baseball fans everywhere. 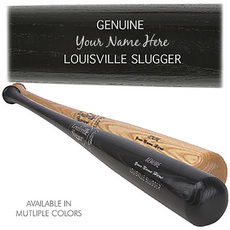 Just put a name between the words GENUINE and LOUISVILLE SLUGGER -- just like the pros!